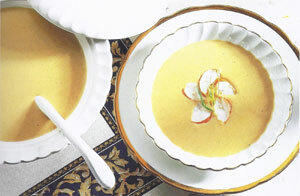 A bisque is a puree flavored with brandy, white wine, and creanu.prepared by a complex process that brings out the maximum flavor. VVhen made with lobster, it is perfect for a special occasion. Melt half of the butter in a large saucepan, add the shallots and carrot and cook gently for 5 minutes until softened. Add the lobster and bay leaf and cook for 5 minutes, or until the lobster turns bright red. Add the brandy and boil until it has reduced to about 2 tbsp, then add the stock and wine. Cook the lobster for another 5 minutes, then remove from the pan and leave until cool enough to handle. Using a mallet, crack the lobster shells, remove the meat (page 107), and set aside. Add the lobster shells, rice, and chopped tarragon to the soup and cook for 15-20 minutes until the rice is tender. Remove the lobster shells and bay leaf from the soup and discard. Cut the cooked lobster into several slices and add half to the soup, reserving the other half for garnish. Puree the soup in a food processor or blender until smooth. Pour the puree through a strainer to make sure that no tiny pieces of lobster shell remain. Return the puree to the pan. Add the cream, lemon juice, cayenne pepper, and salt and pepper to taste, then reheat. Stir in the remaining butter. Serve immediately, garnished with the reserved lobster meat and tarragon sprigs. To kill and cut up the lobster, start by piercing through the cross on the center of the head. Split the lobster in half lengthwise, and remove and discard the intestinal vein and the sack of grit that is found in the head. Scoop out the tomalley (greenish liver) and either discard or reserve for a sauce. Crack the claws, but do not shell them.